Tybalt is a violent person who wants to get into a fight with any Montague that comes his way. Tybalt is wanting to kill Benvolio and calls himself the death of him. Tybalt is an annoying character that even Capulet was finding greedy, when suggesting ruining the party because of Romeo. Tybalt vows to kill Romeo after seeing him at the Capulet party, and not being able to go and fight him. Benvolio tells Montague about his encounter with Tybalt and how he acted. Tybalt is an aggressive character that vows to kill the Montague’s because of their family rivalry but is not the most intelligent character and is a bit of a hot head. I imagine him wearing the colour red because of his “fiery” temper, and in the movies, we have seen from the 1968 and 1996 films the Capulet’s have all worn red clothing to distinguish themselves a part. 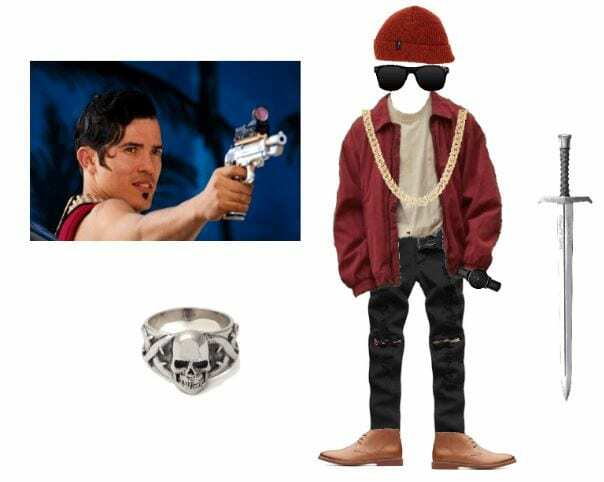 I chose to give Tybalt a chain and sunglasses to give him a kind of spoiled looked since even Capulet told him to be quiet. I gave him the skull ring since he is a very aggressive character who wants to fight any Montague, he comes across including Benvolio. Copy and paste relevant information directly from source:Genetic engineering, sometimes called genetic modification, is the process of altering the DNA? in an organism’s genome?. This may mean changing one base pair? (A-T or C-G), deleting a whole region of DNA, or introducing an additional copy of a gene?. The genetic material of C. elegans can easily be genetically modified to make the worm produce specific proteins the researchers want to study. I will use better time management with my school assignments by the end of the year. I will do this by making sure I don’t procrastinate and start the day I get it. I will always ask the teacher for help if I don’t understand the assignment when I’m given it instead of waiting until the day before its due. If I’m given multiple assignments from multiple classes on the same day, I will make sure I complete them before I go on do something else and start them the day, I get it or order them from most important to least. I will get a B by the end of the semester in CLE 10. I will do this by using good time management and doing all my assignments on time and putting in the effort to make each assignment good. I will make sure to be smart about my decisions and don’t procrastinate and focus on other classes assignments. I will be able to ask my teacher if I have any questions. When I don’t do good on an assignment I will try and do better in my others and really focus on making them good. This song reminds me of all the times my dad told me about his uncle singing to him while they went fishing and the times my dad and I would sing together. I would like my kids to one day get this song stuck in their head too so that they can appreciate it like I have and my dad has. This song reminds me of my time driving up to every month from the age of around five and we would listen to this song every time. We still listen to it everyone once in a while when I see him and we have a good laugh about how stupid the lyrics are yet we still for some reason enjoy it. This song reminds me of my time playing NHL ’08 with my older brother and has stuck with me for a very long time and now. Even though the song wasn’t in the game the song just reminds me of playing NHL and street hockey with him. The Black Keys are my favourite band to listen to and this song still comes up regularly in my spotify playlist. This song reminds me of grade 3 for whatever reason my friends and I would sing it during recess. The bigger picture that it reminds me of though is my stepdad. It reminds me of all the times we would go out in the car and I think he was just wanting to show me a song that he listened to a lot as a kid. This song introduced me more or less into the world of rock. If it wasn’t for this song I would have never gone on to listen to the likes of other artists like Led Zeppelin, Jimi Hendrix, Lou Reed and the Doors. It reminds me lot of grade 6 when I first moved to Poco and I would go over to my uncle’s house and help him with his cars. What have you learned about the history of rockets and space travel? Write a summary on the blog about something or someone you found interesting and tell why. The first sign of rocketry started in 4th century A.D. I found it interesting that most rockets where originally used for war and wasn’t until the 15th century that they where used for good. Now that you know about the basic parts of a rocket and what they do, write about each part and its importance in your own words. What will be different on your water rocket than on a “real” rocket and why? A nose cone is is used to make the rocket have a more aerodynamic movement through the air. The payload is something carried in the rocket. The propulsion chamber is where the engine of the rocket is located. The fin is used for stability for the rocket. Write a little on the blog about how to find the Center of Pressure and the Center of Gravity on your rocket and why they are important. To find the center of pressure you make a cut out of your rocket and balance it on a ruler, where the cut out balances is the center of pressure. To find the center of gravity on your rocket you can tie a string to your rocket and slide it until you find the perfect balance. This is important because you need a balance of the two so that the rocket will remain stable in flight. Based on what you have learned about rocket design (nose cone & fins) describe what your rocket will look like and why you chose that design on the blog. I will use a long nose cone to make it aerodynamic and counteract the air friction. I will use average fins.